Refer to the following link. Make the partitions which are aligned to 2048 sector (1MB) boundaries and normalized by 2^n[GB] unit. Download the Related Softwares, extract dir/files as needed, and install them as needed. WARNING: Don't forget to check and change the device to be selected. Refer to the examples of script (see the "Links" shown below), and edit a script for the parted. Old partition tools and old backup tools may align partitions to cylinder boundaries. If such the old tools may still be used, the gaps for Cyl. boundary should be provided. Nobody guarantees that the data will not be lost. Back up each partition (Burn Partition on CD or DVD) to media like CD/DVD/BD as needed with Paragon Backup & Recovery etc. And/or, check whether each partition has been backed up to media like CD/DVD/BD surely. WARNING: All the data in the HDD/SSD/Memory will be lost. This step may be skipped for the flash devices like SSD/Memory so that those lifetimes may not be shortened. Wipe the HDD (Wipe Disk) as needed with MiniTool Partition Wizard etc. WARNING: Don't forget to make the partition table before making partitions. Apply the script edited as above by redirecting to the parted. Then the partitions will have been created. The parted will be used on "Terminal" window etc. provided on the Linux system of GParted. Such the script function should be implemented in partition tool. (parted) help " Don't forget to check and change the device to be selected. (parted) help " Don't forget to make the partition table before making partitions. (parted) help " Format temporarily with GParted etc. before formatting on Windows. WARNING: All the data in each partition will be lost. 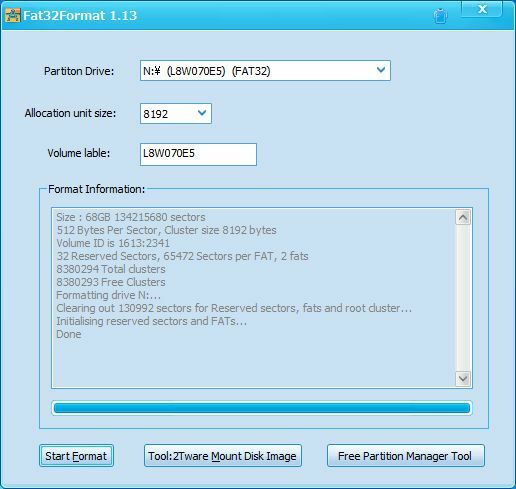 Format each partition to FAT32 temporarily with GParted etc. so that each partition can be formatted on Windows. 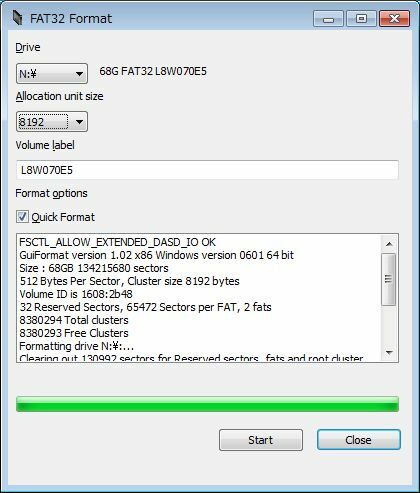 Format each partition to NTFS/FAT32 properly on Windows as needed. Don't use the FAT32 Formatter tools/functions which don't support partition alignment. Use one of the following alternative FAT32 Formatter tools to perform optimal FAT32 format on Windows. its Allocation unit size should be 8192B, 16384B or 32768B to optimize its performance. The following alternative FAT32 Formatter tools are useful. These tools set PBR-BPB Reserved Sectors as fixed 0x20. which uses AFT (Advanced Format Technology; 4096 bytes per physical sector). Note: The title on the following dialog box should be ignored. Note: Press F8 key on the "Windows Boot Manager" screen and select "Enable Boot Logging" to make a "\Windows\ntbtlog.txt". Check the fields of MBR/EPBR and PBR-BPB/EBPB, and modify them as needed. Check the fields of MBR/EPBR and PBR-BPB/EBPB before modification with "bpbf.bat" (bpb.exe) etc. For example, some strange values may have been set to the Notable fields of MBR/EPBR and PBR-BPB/EBPB. 47h-51h Volume Label: "NO NAME    "
Back up the typical NTFS logical partition with Paragon Backup & Recovery etc. while it is empty. Back up the typical FAT32 logical partition with Paragon Backup & Recovery etc. while it is empty. The above empty backups will be used to modify the fields of MBR/EPBR and PBR-BPB/EBPB. And then the above empty backups will be used to initialize the partitions instead of formatting them. Restore the NTFS (empty) backup to all the NTFS logical partitions with Paragon Backup & Recovery etc. Restore the FAT32 (empty) backup to all the FAT32 logical partitions with Paragon Backup & Recovery etc. And change the volume label for each NTFS/FAT32 logical partition as needed with Paragon Backup & Recovery etc. Then the Notable fields of MBR/EPBR and PBR-BPB/EBPB may have been modified as a side effect of restoring. But the Partition Type (System ID) for each FAT32 partition may have been changed from 0x0c to 0x0b forcibly. 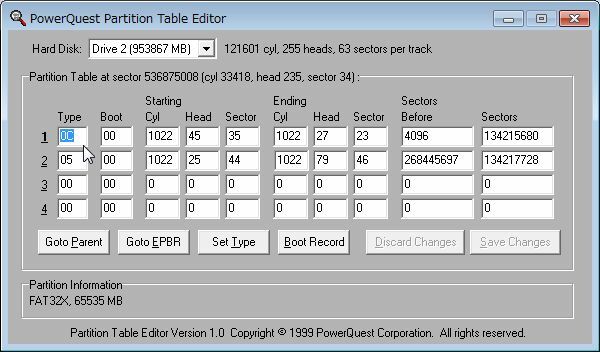 Change the Partition Type for each FAT32 partition from 0x0b to 0x0c with PowerQuest Partition Table Editor. Use "Goto Parent" and "Goto EPBR" buttons to change each screen of MBR/EPBR. Check the fields of MBR/EPBR and PBR-BPB/EBPB after modification with "bpbf.bat" (bpb.exe) etc. The "MBR/EPBR HiddenSectors" (EPBR HiddenSectors) should have been adjusted to 8*n[sct] (or 2048[sct] for MBR). The "1ch-1fh Hidden Sectors" (PBR-BPB Hidden Sectors) should have been adjusted to the converted StartingOffset[sct]. The "PartitionType" (System ID) for each FAT32 partition should have been 0x0c. But e.g. the EPBR HiddenSectors of the 1st logical partition may have been changed from 8*n to 0x1 forcibly. 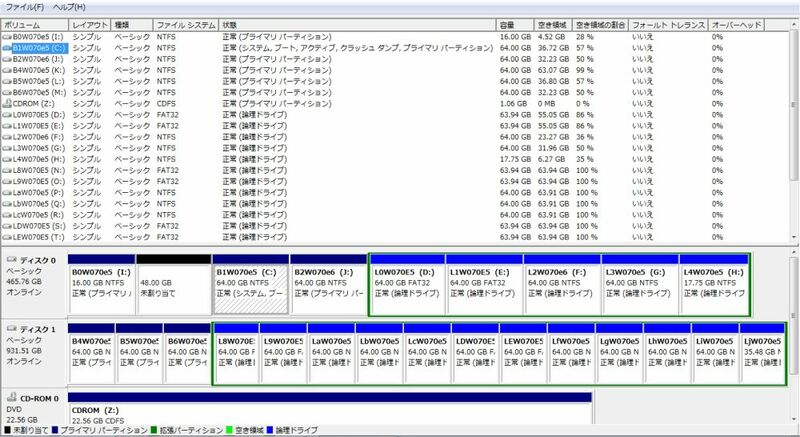 Check the partitions after modification with the parted etc. The start, end and size for each partition should have been "aligned" values. But e.g. the start, end and size of the extended partition may have been changed to "not aligned" values forcibly. Configure a master boot manager and each partition boot manager as needed. Install a master boot manager for MBR as needed with the Multiple Boot Manager "MBM" etc. Rebuild the Boot Configuration Data "BCD" for each partition boot manager as needed with "bcde.bat" etc. The Recovery Partition should be unhidden: 27h->07h with MiniTool Partition Wizard or PTEDIT32.EXE etc. The Recovery Partition should be moved to a runt partition, e.g. the last partition of the disk #0. Then the 1st partition B0 will become free. The Boot Partition should be integrated to the Recovery Partition. i.e. "\bootmgr" and "\Boot\" should be copied to the Recovery Partition. The Boot Partition should be integrated to the other System Partitions. i.e. "\bootmgr" and "\Boot\" should be copied to the other System Partitions. And then the dedicated Boot Partition should be deleted. 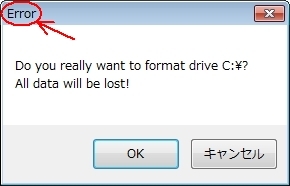 The drive letter "Z" should be assigned to the internal CD/DVD/BD drive. WARNING: All the data in the HDD/SSD will be lost. Copy (back up) the script for the parted to media like CD before wiping the HDD. Restore the backup to the 32/64 bit System Partition before formatting on Windows. And then restore the backup to the 32 (and/or 64) bit Recovery Partition.